Discover interesting facts and information about the weapons, including the Native American Weapons, used by Native American Indian tribes. Early Native American weapons almost always utilized stone in some way and Flint was the most effective stone to use when making a weapon. The process of making weapons from flint was called Flint Knapping and the weapon makers were called Flint knappers. Many Native American weapons were made from a combination of materials. An arrow or spear had a stone or bone arrowhead or point which was attached to a wooden shaft or handle all of which were held together with a cord usually made from animal sinew or with a type of glue. Arrows would also have feathers attached which improved the flight of the arrow. Native American weapons included Tomahawks, Axes, The Lance, bow and arrows, Shields, knives, Atlatl - spear throwers, Spear, Blowguns, War clubs, Arrowheads, Battle Hammers, Jawbone clubs and Slingshots. Although these were all made of stone these primitive weapons were still deadly. The later types of Native American weapons replaced those made of stone, horn, bone and hardened woods with metals such as iron and steel. 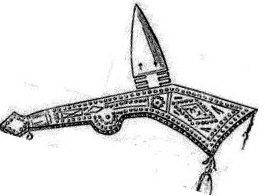 But many of the replacement weapons were based on traditional native designs. Various embellishments were added to weapons such as engraving or carving and the addition of paint, quills, feathers and beads. The rapid evolution of Native American Indian weapons occurred due to contact with the Europeans. Stone weapons were replaced by weapons using iron, steel, copper and brass. Then the Native American Indians acquired guns and rifles from the traders and settlers. The following chart details a list of the names and descriptions of the variety of weapons used by the Native American Indians. The following chart and list of Native American Weapons provides the names of the stone weapons and their descriptions together with details of later weapons that were developed due to the new technology brought by the Europeans starting in the 1600's. Projectile Points A projectile point was a blade that was hafted to a projectile, such as a spear, dart, arrow, or throwing knife. Tanged points are projectile points that have a tang at one end to facilitate hafting. Projectile points fall into two general types, the large spear or lance points and the smaller arrow points. Clovis points are leaf-shaped and have a wide groove on both sides of the base for fitting into short wooden spear shafts. Arrowheads An arrowhead weapon point or tip made of stone or sometimes bone usually fixed to an arrow. Arrowhead points were smaller than spear points and penetrated skin more deeply than when fired by a bow. Refer to Arrowheads. The Tomahawk was an axe-like weapon that had a wooden handle with a head made of stone. The tomahawk could be used for close contact fighting or as a throwing weapon. 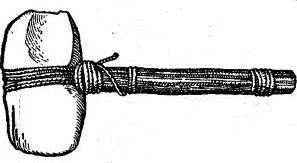 The tomahawk weapon was originally made with a stone head but developed in the 1600's using European technology. 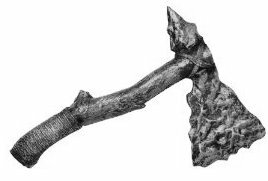 The new style tomahawk was basically a lightweight axe that had a metal edge on a solid wooden handle. Shields Native Americans Shields are classed as defensive weapons. Discover facts and info about the War Shields and the Medicine Shields. Lances Long lances were used by horse riders to knock off their enemies from their horses. A lance provided Native Americans with leverage and protection during battle. They would often decorate their lances using feathers and scalps to give them an intimidating appearance. Knives were flaked from stone to form one or more cutting edges. Knives were essential tools used for cutting meat, hides, wood and food. War Clubs War Clubs. The hitting edge of the war club was rounded and measured between 20 and 30 inches long. Jawbone Clubs A Jawbone club weapon was constructed out of the jawbone of a buffalo or a horse. The Plains Native Americans would sharpen the hitting edge of the weapon while leaving the teeth inside the jaw bone intact. The jawbone club was used as a close combat weapon and had the ability to cut through the chest of an opponent. A sling or slingshot was one of the oldest and most primitive Native American weapons. 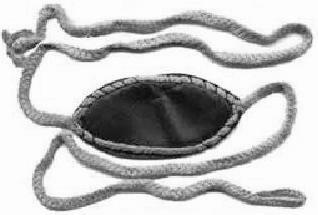 Two pieces of cord made from plant fiber or sinew were tied to a leather pouch to hold the sling stones. Spear throwers (called Atlatls) Spear throwers called Atlatl were a device used to throw a spear with greater propulsion. They were commonly used by the Pueblo tribe and the Artic and Sub-Artic tribes for hunting large marine animals such as whales. Blowguns A Blowgun was primarily a hunting tool used by the Cherokee and many other Native American tribes. A blowgun consisted of a tube made of cane or reed through which darts could be shot by the force of the breath. Also referred to as a blowpipe or a blowtube. Refer to Poisoned Arrow. Throwing Sticks - Rabbit Sticks Throwing Sticks aka Rabbit Sticks were one of the earliest weapons used by Native American Indians. They were a basic short stave or wooden club that had a straight pointed wooden shaft or curved wooden club, similar to the boomerang weapon. Used to hunt small game such as rabbits or water fowl. Hatchets A Hatchet Axe is a small axe with a short handle that was used with one hand. Bolas A bola is a rope with weights attached to the ends; is thrown to entangle the legs of an animal or person. 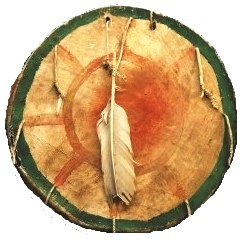 The bola was common weapon in South America but was also used by the Inuit Native Americans. Battle hammers A Battle hammer has a blunt, hammer-like head on one side of the handle or shaft, and usually a beak or point on the opposite side. Axe-Like Club The Axe-like club was made of either stone or metal blades. Gunstock Club The Gunstock Club was so-called because these weapons resembled the shape of a a musket or rifle body and carved in the shape of a European gunstock. Gunstock clubs were widely used across North America in the late 18th and 19th centuries, both as weapons and status symbols. They were often made with hard wood or whale bone and embellished with carvings on the handle. Stone Ball Club The Stone Ball club was primitive but lethal. It consisted of a round-headed stone that was completely covered in heavy buckskin or rawhide and attached to a wooden handle. The head was relatively free-moving and used by the early Plains, Plateau and Southwest Native Indians. Fixed Ball Club The Fixed Ball club was used with the intention of breaking the enemy's jaw with a violent upward thrust. Bird Head Club The Bird Head club was elaborately designed to resemble the head of a bird. During the late 1860s that the Native Americans began to acquire up-to-date weaponry from the Europeans. The first modern weapons used by Native Americans in any number were the Winchester rifle and the Springfield rifle. The first documented use of these modern rifles against the opposition was when the Native Americans used them during the battle against General George Custer at the Battle of Little Bighorn in 1876. Flintlock muskets Flintlock muskets are types of early guns. It is a muzzle loader having a flintlock type of gunlock that has flint embedded in the hammer. The flint makes a spark that ignites the charge. Winchester Rifle Winchester rifles were among the earliest repeating rifles. The original Winchester rifle was made in 1866. This gun had a lever-action mechanism that allowed the rifleman to fire a number of shots before having to reload - hence the term "repeating rifle". The Winchester repeater rifle is known as "The Gun that Won the West" for its predominant role in the hands of Western settlers. Springfield Rifle Springfield rifles took their name from the Springfield Armory, established at Springfield, Massachusetts in 1794. Smoothbore muzzle-loading rifles were produced between 1858 and 1865 followed by single-shot rifles and eventually the Springfield repeating rifle. The stone weapons of the Native Americans were influenced by the new technology and weapons such as the tomahawk were further developed. developed. The original tomahawks had stone blades when they were changed to metal blades the tomahawk was adopted by the European settlers, traders and hunters. It was therefore not uncommon to ‘marry’ a traditional Native American stone weapon with a European style blade or hilt. The pictures of weapons on this page illustrate the new weapons and the old stone weapons of the Native American Indians. The white settlers and traders brought weapons brought advanced weapons from Europe that used technology that was unknown to the Native American Indians and their Stone Age Culture. The European weapons made the use of steel in their knives and swords. They also had strong fire-power using weapons such as the fire-belching arquebus, hand guns, rifles and cannon. The influence of the European style weapons on the Native Americans began in the 1600's when the European colonists and the Fur Traders arrived, necessitating regular contact between the two culture groups. The traders used weapons to trade for furs. The nature of hunting and warfare changed and Native Americans traded for European-style weapons whenever they could. Native American Weapons. Discover the interesting facts and information which relate to the History of Native American Weapons. The pictures on this site show the weapons and tools that were used by various Native Indian tribes that can be used as a really useful educational history resource for kids and children of all ages. 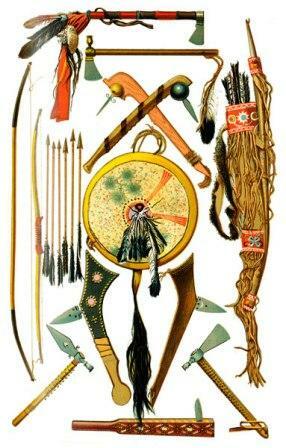 We have included pictures and videos to accompany the main topic of this section - Native American Weapons. The videos enable fast access to the images, paintings and pictures together with information and many historical facts - a great educational resource for kids providing an unusual insight into their culture.